Edit: I actually wrote this last night, but apparently when I hit “Publish”, WordPress didn’t actually publish it, or something went wrong, or I hit the wrong button but thought I’d hit the right one… who knows. Here it is now, in any case. I’ve been having some technical difficulties with my camera the last couple of days, and as I sort them out I’ve been relying on photos I’ve already got on my hard drive. Fortunately, there are plenty, some 30,000 image files, in fact (I think I should be back to shooting new stuff again tomorrow anyway, though). Today’s photo is actually going waaaay back. I took these pictures last October, while visiting my parents’ old house for Thanksgiving. I found this intriguing insect sitting on the railing of the front entry porch. When most of us think of crickets, what probably come to mind are field crickets, those chunky-bodied black insects that we’ll often see in the lawn or gardens. A few reptile owners might think of the brown sort you buy from the pet store, which are called house crickets. However, there are some 115 cricket species to be found in North America, in 25 genera. These encompass a broad range of shapes and sizes. Crickets share the thick, strong hind legs and long antennae with their cousins the grasshoppers and katydids. They can be told apart from these other two groups by a pair of long, thin tail projections extending from the rear of the abdomen. Tree crickets are a very slender group compared to most other crickets, and more resemble grasshoppers than crickets. They belong to the genus Oecanthus, and most members are primarily identified based on the pattern of black markings at the base of their antennae. 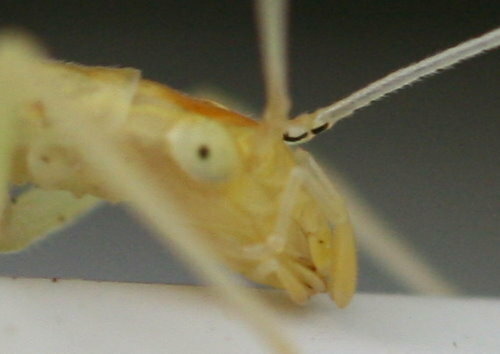 I neglected to get a good photo of the face of this one, but did find one that showed the base of the antenna, and cropped it in closely. Based on this photo, I believe this to be a Narrow-winged Tree Cricket, Oecanthus niveus, which have J-shaped lower markings. They hatch in early summer, and are grown and mate in the fall. It’s possible this one was out looking for a partner. My Kaufman Insects guide indicates that Nathaniel Hawthorne wrote about the song of tree crickets that “If moonlight could be heard, it would sound like that.” Rather than the repetitious “chirp chirp chirp” that we think of as filler in uncomfortable silences, tree crickets sing in long trills. You can hear a male of this species at this YouTube video (links to YouTubes of other species are there as well). Females can be told apart from males by their long, thick ovipositor. This one is a female. I’m not certain what she’s doing in this photo; she bent her abdomen forward underneath her and appeared to be cleaning it. You can see her two “tail” projections folded against the ground underneath her. 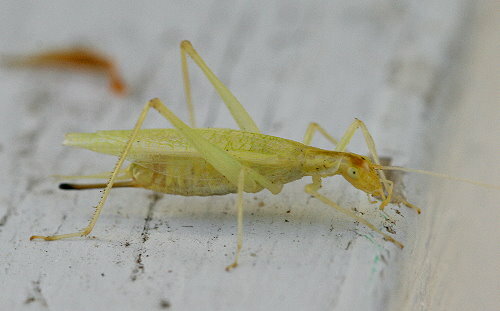 Typically, tree crickets eat aphids and other soft insects, though they’ll occasionally forage on fruits and foliage. It appears that most of their leaf-munching is tied to creating song posts from which the males sing to females. They cut a small hole in the leaf, and sit in it while they call, I guess using the leaf as a parabola. You can read a bit more about the life history of tree crickets at the website http://oecanthinae.com/ – the tree crickets have their own web domain even! Interesting post on tree crickets. I think I hear those at times during the summer. During warm months, crickets will do their chirping for hours in the evening. It gets quite loud, so many of them all making noise at once. Nice post! 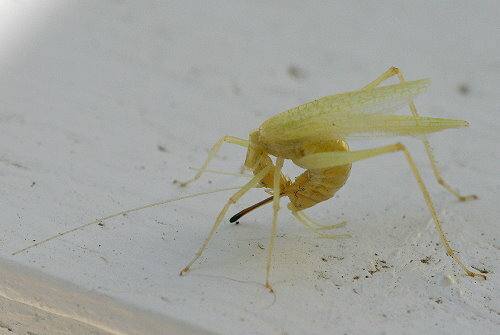 I just took a photo of what looks to be this same type of cricket!..I had never seen one before..
Beautiful pictures. Do you mind if I ask what type of lens you have? The level of detail is exquisite! She’s lovely and intriguing. Great find! it is lovely to see it tending to itself! They are so cool aren’t they. Have you seen Wil Hershbergers book on The Songs of Insects? I am lucky that he lives in my area and takes us all for walks in the evening to learn their songs. Fascinating insects. You have really great photos. I love your posting about this tree cricket. She is indeed a Narrow-winged tree cricket, Oecanthus niveus. Females do quite a bit of grooming, which this gal might be doing in the photo. However, this is also a position they assume when detaching the spermatophore after it has finished emptying its contents into her. They then eat the empty sac.